Football games, favorite recipes, family gatherings – here's to a great Thanksgiving holiday for all. I also want to let you know that I'm grateful for being in your network. You can count on me for practical guidance & advice. With December fast approaching, let's be sure that we're getting homeowners & homebuyers to think about year-end strategies for saving money in an exceptional market. It would be a pleasure to help. Happy Thanksgiving! It was a surprisingly quiet week for mortgage rates with little of the daily volatility seen in recent weeks. Investors continued to watch the situation in Europe, but events there had little impact. The US economic data was roughly neutral for mortgage rates, and rates ended the week with little change. The economic data released last week was positive for the economy, with stronger than expected economic growth and lower than expected inflation. Retail Sales, Industrial Production, Housing Starts, and Jobless Claims all exceeded their consensus forecasts. Meanwhile, Core CPI inflation was a modest 2.1% higher than one year ago. For mortgage rates, the tame inflation data was positive, while the relatively strong growth data was negative. Investors continued to closely monitor the debt troubles in Europe. While Italy's bond yields remained below the highs reached last week, bond yields in France and Spain climbed to new highs. Investors are concerned that nearly every euro zone country except Germany is at risk of seeing a sharp rise in yields, which will make it even more difficult to meet their debt obligations. Weaker euro zone countries are increasingly looking to Germany for additional aid, but the Germans are reluctant to bear the cost. The level of aid provided by Germany, most likely through the European Central Bank (ECB), will heavily influence the ability of the other countries to resolve their debt problems. 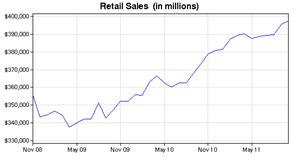 Ahead of the Thanksgiving holiday next week, Existing Home Sales will come out on Monday. Revisions to third quarter Gross Domestic Product (GDP) will be released on Tuesday. 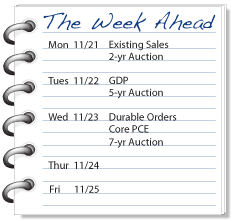 The remainder of the week's data will come out on Wednesday, including Durable Orders, Personal Income, Core PCE inflation, and Consumer Sentiment. The FOMC Minutes from the November 3 Fed meeting will also be released on Wednesday. There will be Treasury auctions on Monday, Tuesday, and Wednesday. MBS markets will be closed on Thursday for Thanksgiving, but they will be open on Friday.